The United States Congress designated the Zion Wilderness (map) in 2009 and it now has a total of 124,406 acres. All of this wilderness is located in Utah and is managed by the National Park Service. The Zion Wilderness is bordered by the LaVerkin Creek Wilderness to the north of the northern portion, the Goose Creek Wilderness to the north of the southern portion, the Deep Creek Wilderness to the north of the southern portion, the Beartrap Canyon Wilderness to the east of the northern portion, the Taylor Creek Wilderness to the east of the northern portion, the Red Butte Wilderness to the south of the northern portion, the Blackridge Wilderness to the southwest of the northern portion, and the Canaan Mountain Wilderness to the south of the southern portion. Located in Washington, Iron and Kane Counties in Southwestern Utah, the Zion Wilderness encompasses some of the most scenic canyon country in the United States. The Wilderness is part of Zion National Park and is characterized by high plateaus, a maze of narrow, deep sandstone canyons and striking rock towers and mesas. The area is a showcase of geology. Geologic processes have played an important role in shaping Zion. The arid climate and sparse vegetation allow the exposure of large expanses of bare rock and reveal the park’s geologic history. Everything in Zion takes life from the Virgin River's scarce desert waters. Water flows, and solid rock melts into cliffs and towers. Landscape changes as canyons deepen to create forested highlands and lowland deserts. A ribbon of green marks the river's course as diverse plants and animals take shelter and thrive in this canyon oasis. From the beginning people sought this place, this sanctuary in the desert's dry reaches. The very name Zion, a Hebrew word for refuge, evokes its significance. But when lightning flashes water falls erupt from dry cliffs, and floods flash down waterless canyons exploding log jams and hurling boulders. Zion is alive with movement, a river of life always here and always changing. In Zion, massive canyon walls ascend toward a brilliant blue sky. To experience Zion, you need to walk among the towering cliffs, or challenge your courage in a small narrow canyon. These unique sandstone cliffs range in color from cream, to pink, to red. They could be described as sand castles crowning desert canyons. 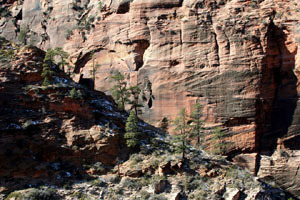 Zion's unique geographic location and variety of life zones combine to create a variety of habitats for a surprising array of plant and animal species. Located on the Colorado Plateau, but bordering the Great Basin and Mojave Desert Provinces, Zion is home to plants from each region including cacti and desert succulents, ferns, grasses, trees, shrubs and wildflowers. It is also home to a variety of mammals, birds, reptiles and insects. Differences in elevation encourage this diversity; mule deer and turkey wander forested plateaus; bighorn sheep and juniper prosper in canyons. Threatened and endangered species found in Zion include the Mexican Spotted Owl, Southwest Willow Flycatcher, and Desert Tortoise. Rare/Special concern species include the Zion Snail, Virgin Spinedace, and Peregrine Falcon. Planning to Visit the Zion Wilderness? How to follow the seven standard Leave No Trace principles differs in different parts of the country (desert vs. Rocky Mountains). Click on any of the principles listed below to learn more about how they apply in the Zion Wilderness.